Delicious recipes prepared with carefully selected garden vegetables. 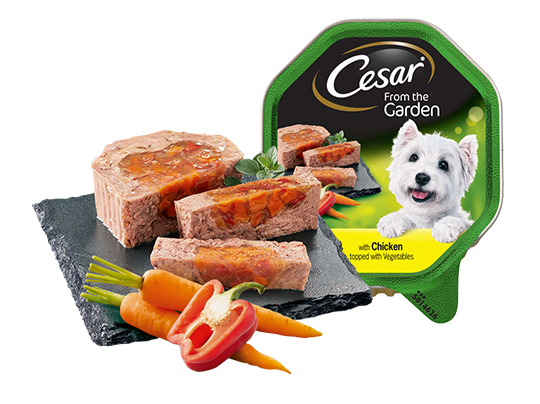 These tender loaves with a delicate core of garden vegetables will turn your dog's mealtimes into delightful moments of joy for him… and for you. A 5 kg dog requires 3 trays per day, a 7 kg dog 3 1/2 trays, a 10 kg dog 4 1/2 trays. We recommend to feed a mix of wet and dry food, just halve the recommended quantities of respective products. Allow a transition phase and adjust amounts according to your pet's needs. For more information on feeding your dog, please contact our Consumer Careline. Water should always be available.